This morning we had something special set up for Liv when she came downstairs. You see, we had very kindly been sent a lovely selection of Superhero goodies from Mattel to celebrate National Superhero Day. How exciting!! The first thing she reached for (of course) was the beautiful Barbie Princess Power herself. This is a very special version of Barbie because in the Barbie in Princess Power film, Kara is kissed by a magical butterfly which gives her amazing super powers. Wanting to keep her identity secret, Kara invents her alter ego - Super Sparkle! 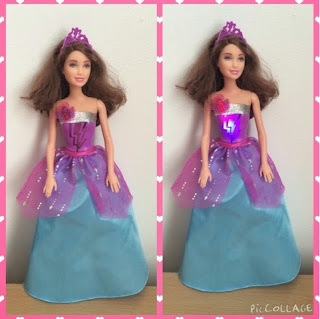 This Barbie is very special too because when you press the button on her bodice (while holding her by the legs with the other hand) she gives a quick twirl and her beautiful ballgown becomes a cape! Twist her legs again and the cape turns back into a skirt. 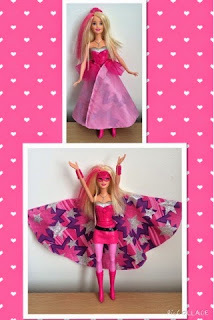 She is also wearing a tiara that doubles up as her Superhero mask and has very cool Barbie pink streaks in her hair. Alongside Barbie in the film, stars her jealous Cousin Corinne - boo! Corinne captures the butterfly that kissed Kara and uses it's magic to transform herself into Super Sparkles nemesis - Dark Sparkle. This doll is beautiful too, while she doesn't transform into a Superhero, she has a lovely 3D butterfly on her chest that when pressed, lights up the bodice of her dress and makes a little kiss sound. 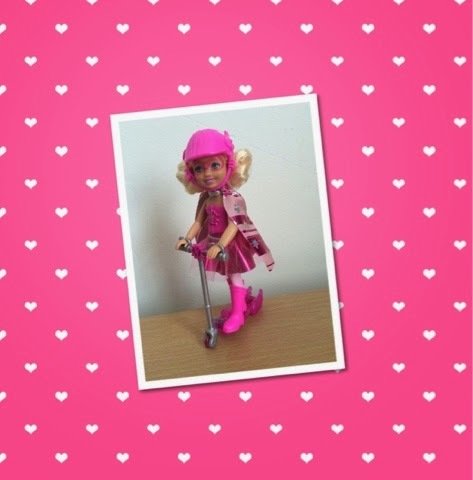 Liv also received a lovely little Chelsea doll dressed as her favorite Superhero and riding a pink 3 wheeled scooter. She is wearing a safety helmet and has her face painted with an eye mask. She is very cute and Liv loves pushing her along on her 3 wheel scooter. Now my personal favorite item is this Super Transforming vanity playset. 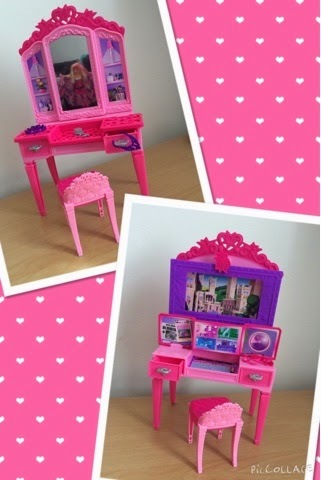 In the top picture you see it as a very pretty dressing table, complete with mirror, necklace, tiara and hairbrush. Then with a quick twist of the mirror and a gentle pull of the left drawer, it turns into a command center with computer screens and a space for a smartphone to be added. It also comes with a pink eye mask and Superhero cuffs. The set is also a perfect match to the Malibu Beach House (reviewed here) so will be disguised as a dressing table easily during play. She also received a makeup set containing a lip balm, face shimmer and blue sparkly eyeshadow. She especially loved this as I have never allowed her to have make up before, I allowed a little bit for Superhero Day! She really enjoyed the DVD and sat happily enthralled throughout. She usually runs away and hides behind something when the bad Guys come out or something not so good happens but she was quite happy to watch this whole film without taking to her corner! Since watching the film she has acted out the story with her Dolls and been flying around wearing her blanket as a cape - great fun and it has really got her imagination working. The story is lovely and easy to follow with lots of different characters to relate too - especially the worried Parents! There is even a free pink Superhero mask inside the box! I would definitely recommend this film and toys to Family and Friends and I'm sure we will be watching it and acting it out many times in the future.